Frank Bidart, Andrew W. Mellon Professor of the Humanities and Professor of English, has won the National Book Critics Circle Award for Poetry in recognition of his latest collection, Metaphysical Dog (Farrar, Strauss & Giroux, 2013). The award is the one of the most distinguished American prizes offered to a poet for a single publication. Bidart is considered one of the most significant contemporary American poets writing today. Originally from California, he earned his B.A. at the University of California-Berkeley and an A.M. from Harvard, where he became friends with poets Robert Lowell and Elizabeth Bishop. As the Poetry Foundation notes, Bidart’s first two books, Golden State and The Book of the Body, attracted some critical acclaim, but it was his third, The Sacrifice, that established him as a truly original poet. Since then, Desire, Stardust, and Waiting for the Spring Festival have each been nominated for the National Book Award. He has also been nominated for the Pulitzer Prize on numerous occasions. Bidart joined the Wellesley faculty in 1972 and teaches a range of courses, including creative writing workshops and seminars on modernist poetry. 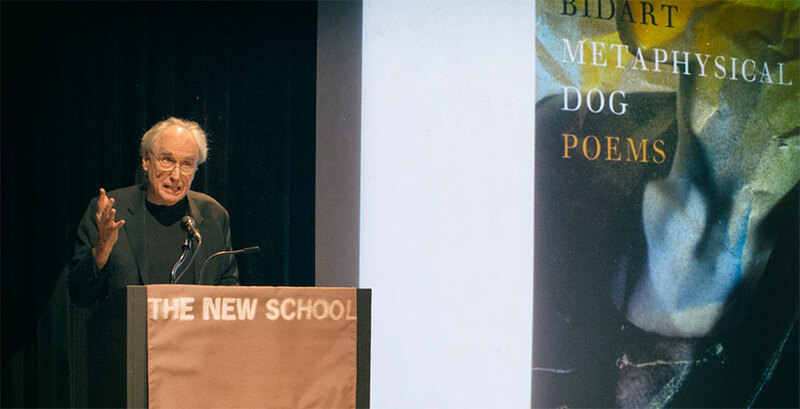 Watch Bidart’s acceptance speech (the poetry award begins at minute 40:00) at the New School in New York City.